Yes, I know it’s Saturday, but I needed to share my love for Cookie Friday. I’ve been baking cookies on Friday for as long as my kids have been in school. I thought it was a great treat after a long week, and my kids usually had friends over after school. My kids go to school with their cousins, from both sides of the family, and they’d often find their way to my house on Friday afternoon for warm cookies. I tried to time it so the cookies were still warm when they all arrived. This recipe is my classic Chocolate Chip Cookie recipe. This time I just swapped out the chocolate chips for M&M’s. As a side note, I don’t do this very often because the M&M’s have dye in them and there is one member of our family who does not react well to dyes. Mix until soft and fluffy. Mix it up and add a bag of M&M’s or chocolate chips. 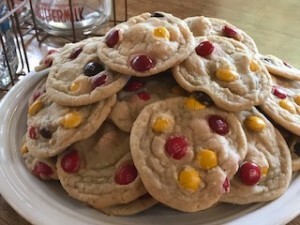 With M&M cookies, I find that they are prettier if you also add a few candies to the top just before baking. Welcome back, Cookie Friday. Welcome back.